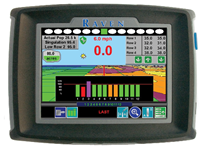 Envizio Pro II™ is Raven’s complete multi-function field computer for growers, giving you more power to control, simplify and improve virtually every phase of your farming operation. From your first pass to your last, Envizio Pro II is the perfect interface for tying your different system functions together—and rewarding you with greater efficiency, performance and savings. Seamless operation. Envizio Pro II is the driving force for all system functions. From integrated GPS technology, advanced data mapping and record keeping to dual product control, boom management, assisted steering and planter controls, Envizio Pro II works seamlessly to deliver greater efficiency and performance. Doing more with less. With the latest in advanced computer software and RTK technology, Envizio Pro II brings a new level of accuracy and control to virtually every production area. That means greater savings in farm inputs with more efficiency and productivity from planting to harvest. Intelligently designed. Envizio Pro II is designed with the flexibility to accommodate your immediate needs—and let you grow your system capabilities when conditions change and the time is right. Compatible with commonly used industry software and equipment. Slingshot-ready for wireless data transfer, remote support capabilities, high-speed Internet access—and more!